KEEPS THE FIZZ IN... THE BUGS AND BAD STUFF OUT! TAKE CAPPY™ ANYWHERE... IT'S KEYCHAIN READY! Want to See How The Cappy's Patented Design Works? The Cappy is designed to universally install on the tab of any canned beverage (even oversized tabs). It slides easily under the unopened can tab making opening effortless. 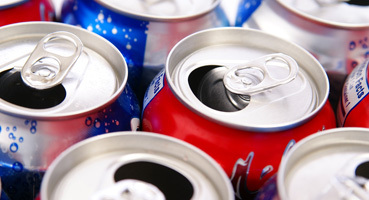 Turned over, placed back on the tab, and with a slight push of one finger, The Cappy rotates to CLOSE the beverage can. It is easy, convenient, and re-usable. KEEPS BUGS & BAD STUFF OUT! Never before has the consumer of a beverage can been able to CLOSE the can after opening; until now. The Cappy, provides protection and peace of mind from anything getting into your drink. At a party or cookout, at the beach, in a golf cart, in the car, pool side or in the office break room refrigerator, the Cappy CLOSES your beverage can to protect its integrity, extend freshness, and inhibit spills. 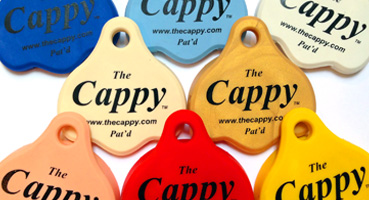 The Cappy is available in 12 distinctive colors. By personalizing your beverage can with a colored Cappy, you are able to put your drink down and return confidently knowing your beverage from others. This identifying feature prevents having to discard numerous partially used beverages because the consumer wasn’t sure which drink was theirs. The Cappy’s personalizing feature prevents wasted beverages and saves money. 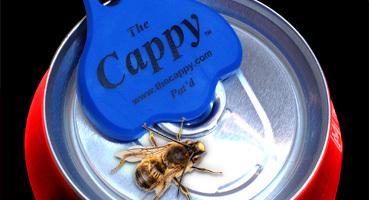 The Cappy™ is the only beverage can "OPENER" that allows you to "CLOSE" the can after opening. It instantly personalizes / identifies your beverage, is easy to use (and re-use), keeps drinking surfaces cleaner, prevents anything from getting inside your drink, reduces spills and fits on practically any standard can tab. THE CAPPY - FEATURED ON SHARK TANK! The Cappy was featured on ABC's Shark Tank and received 2 offers from the celebrity panel. The Cappy™ - "We've Got You Covered."